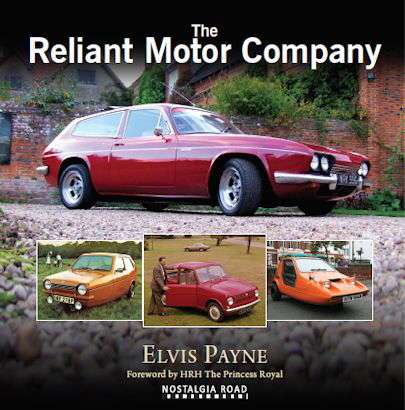 Recently released and widely available, The Reliant Motor Company is the first book on Reliant to cover Reliant’s complete history in a single volume.. Past books on Reliant have just covered specific areas whereas this book covers all Reliant models, the three-wheelers, the economy four-wheelers, the sports cars, the export models, prototypes and other projects. It also quashes some of the myths that have arisen, especially over the last 10 years or so, in which the history of Reliant has been skewed as some are taken to be actual facts. Research for the book has gone back to the basics investigating new sources along with the assistance of dedicated Reliant enthusiast and numerous ex-Reliant employees and directors. The latter includes Barrie Wills, Ed Osmond, Jonathan Heynes, Kevin Leech and Stewart Halstead. Along with Reliant directors are Tom Karen and Peter Stevens from Ogle Design Ltd, Les Collier from B&N Plastics and Mike Hyatt from IAD. In addition, E.S Thompson’s (co-founder of Reliant) daughter, Pat Afford, and Ray Wiggin’s (Managing Director) daughter, Ruth Kitchen, have also provided information. This along with archived material from the Reliant Sabre & Scimitar Owners Club, the Reliant Owners Club and the author’s own archives. A foreword for the book is provided by HRH The Princess Royal. Events from the war years . Plans in 1989 which included ceasing all development of future vehicles. The Metrocab protest in 1991. Books can be purchased direct from Crecy Publishing, via Amazon along with other major on-line book stores.